In addition to keeping this blog, I write a weekly column “Down on the Farm” that appears in several local newspapers. 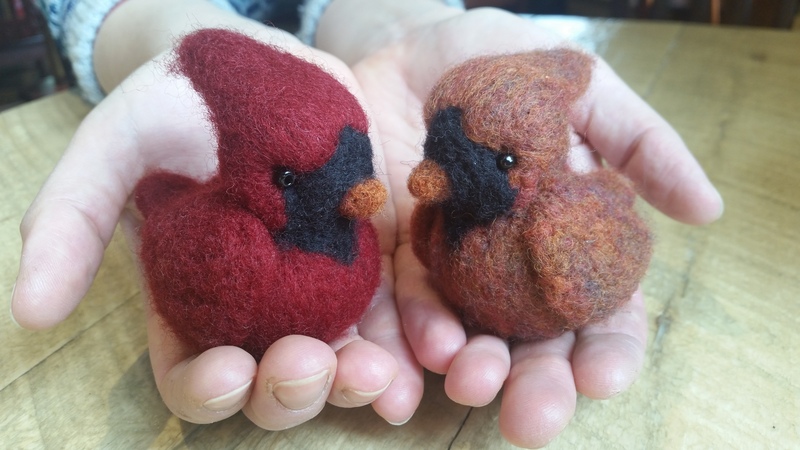 Last week’s theme was inspired by teaching a “Needle Felt a Cute Cardinal” class at the Duluth Folk School. Below is the full article, along with some amazing photos by the school’s director Bryan French. I will be returning to the folk school April 26th to teach a little fox needle felting class. There is a magic to making things with your hands. Potters, carvers, and knitters know this well. You begin with the most basic of materials (clay, wood, yarn, etc.) and in the end create something that was not there before—something that previously only existed in the conceptual. Traditional hand skills used to be taught at home, even at school, but many are disappearing today. And yet, even in the face of our love affair with technology, folks are yearning to reclaim and keep these hand skills alive. At Farmstead, we utilize our Fiber Loft for classes and workshops, hosting students from eager 9-year-olds to adventurous retirees for afternoons of hands-on projects. 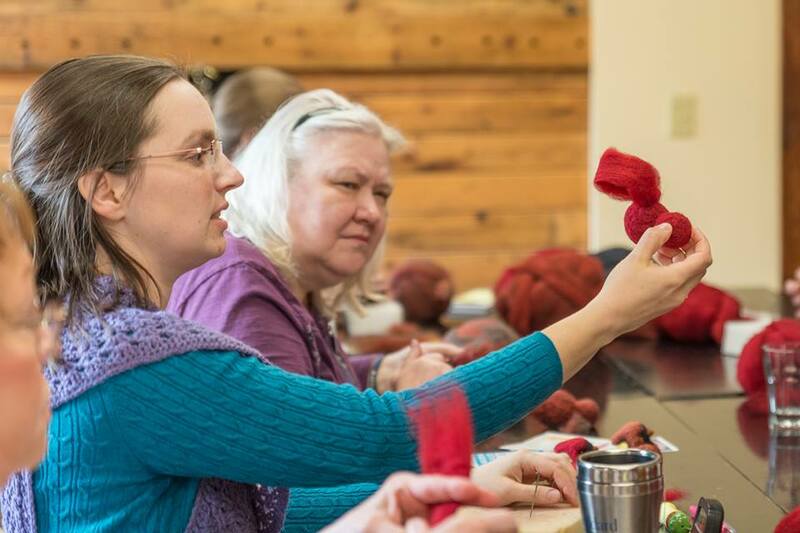 This winter, the needle felting classes took off virally through our social media presences, with classes filling well in advance. So here, technology actually spurred connection with Old World skillsets. Even in the depths of winter and impending snowstorms, people were willing to get into their cars and come out to make a cute snowy owl or chickadee, even if they had never felted before. What is needle felting? It’s a dry felting method that uses a sharp, barbed needle to transform fluffy, carded wool (in our case from our own sheep) into nearly any shape or critter you can imagine. As the wool is repeatedly poked by the needle, the barbs rubbing against the scales of the wool fiber causes the wool to rachet tightly together. The more pokes, the firmer and denser the wool becomes. It’s a surprisingly simple process that works magic when you learn how to layer, twist, and add pieces and colors to build a critter. Each one turns out a little different—unique to its maker. Yesterday’s “needle felt a puppy” class was riotous with youth, a grandma, and a mom as we each tried to mimic a different breed of dog. There were Labradors, Retrievers, Scotties, Terriers, and Border Collies. And, of course, then there had to be collars with tags, and some imaginative students also decided to felt hats for the pups! We were all laughing and telling stories about the dogs that had graced or wrought havoc in our lives. 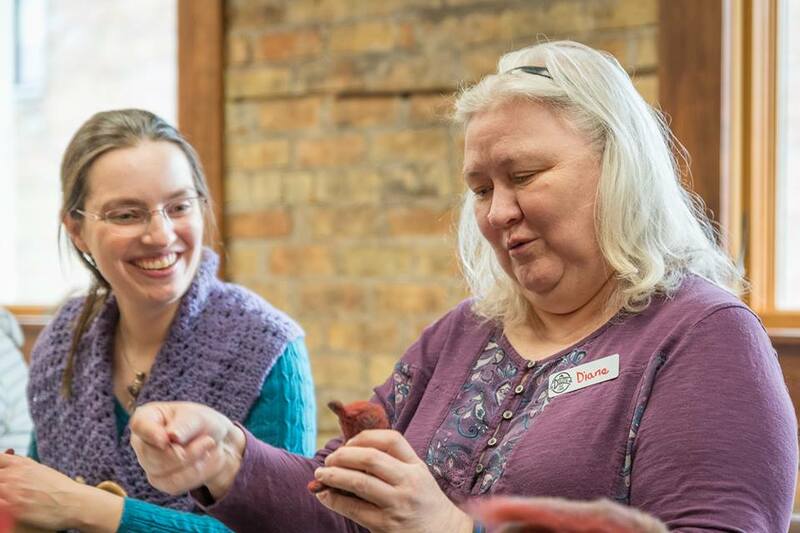 This last week, I ventured north to the Duluth Folk School to teach needle felting. In this class we made cute cardinals. 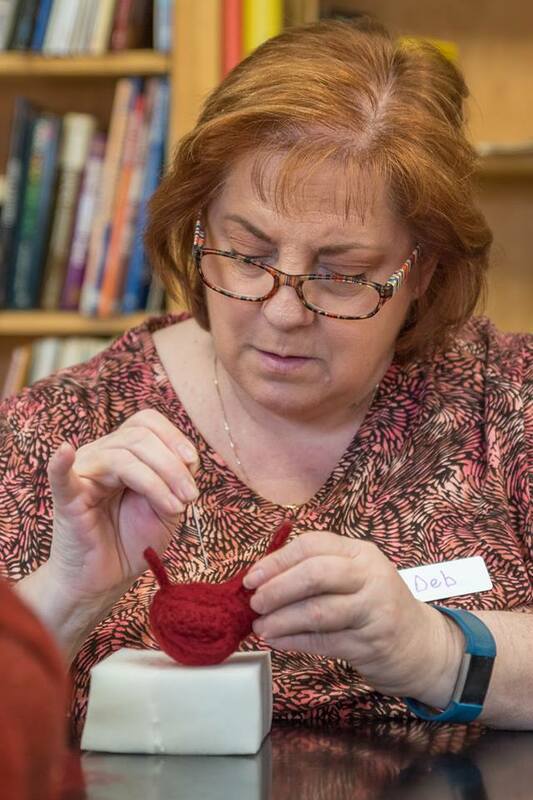 Everyone was new to felting, but they soon were feeling the magic of stabbing wool with our tiny dagger needles (yes, this can be very therapeutic) and watching the red fluff on the table transform into cardinals of varying chubbiness. Everyone went homeward with their own finished cardinal as well as their felting needle and foam work surface. Some of the students also purchased additional wool roving to continue the adventure. Yes, any hand-made process is really quite incredible. It is the manifestation of thought into form, through the hands and heart. Curious? Here are some upcoming needle felting classes I’m hosting. Please remember to pre-register, as they can fill up. Here’s to all those who create with their hands. Let’s keep these traditional skills alive so that generations to come can sit back with a satisfied smile and be able to say, “Hey, I made that.” See you down on the farm sometime.